He loved her. She right back at him. They lived in the hills amidst vast expanses of empty lands. Their love seemed to be born of the landscape. Man, a tribal soul had fought and killed for what he called his own today. The princess’ father was a blind man. And as he groped his way about, the prince got killed. A pyre flamed up, the agony of love drew her into the pyre and they both rose up to the heavens. Their premature departure wasn’t quite; they returned. The princess set herself with the tea plant as leaves while the prince turned white as salt. 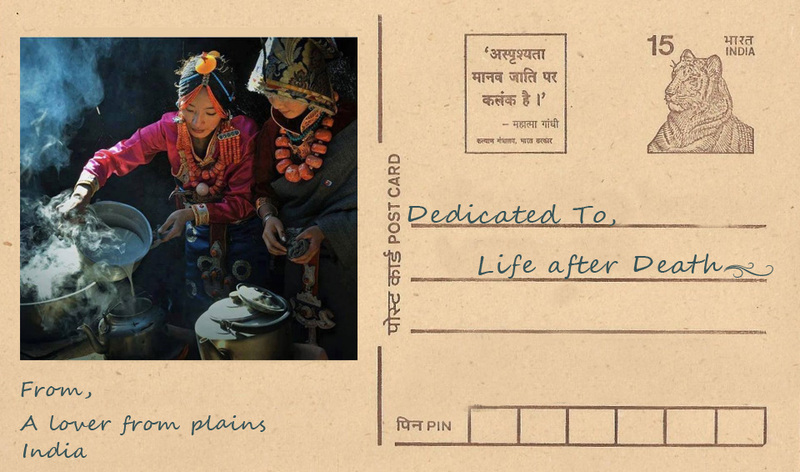 And ever since, butter tea is brewed in Ladakh. The prince meets the princess now on a different sort of pyre. One of the utmost reason to have tea in the cold mountains. Something which leaves you wanting to know more. What happened did they meet. The sadness dampens and you stretch your arm and drown down the dampness and see life for what it is -a reminder that things are are not what they seem but what you make of it ! I want to be free, chuffing and puffing life away has no meaning. Lets travel travel, marvel at the dew, the tear drop and laugh at the grass tickling you or run with the butterfly -can you ? It’s because the child in us has died.